I’ve had stuffed mushrooms many times, but i had never thought of making it at home till my best buddy made them for me. Stuffed mushrooms i had had till then was made using portobello mushrooms. Portobello mushrooms have a wider cap making it easier to stuff. While it is a commonly consumed type of mushroom world over, it is stocked only in a few gourmet stores in india. So most of my experiments with cooking is limited to button mushrooms which are freel available. 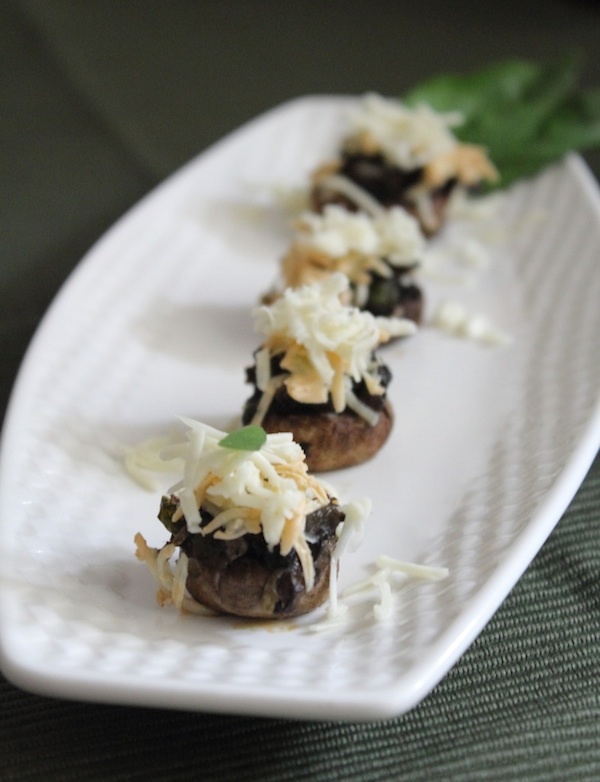 When my buddy introduced me to the stuffed button mushrooms, i savoured it. You can stuff the mushrooms with sauteed onions, stem of the mushrooms, cottage cheese, capsicum..the options are endless. It is a good appetizer for parties which can be pre-made and grilled/baked just before serving it. So if you live in a place where portobello is available, use it, else button mushrooms should serve the purpose just fine!! Remove the stem from the mushrooms and chop them finely. Heat oil in a pan and add the onions & garlic and saute them till the onions are light pink in colour. Now add the chopped mushroom stems and cook till the water from the mushrooms evaporate. Add the herbs, pepper, salt and mix well. At this stage add the capsicum and saute for a minute. Preheat your baking oven at 180C. Fill the mushrooms caps with a generous portion of the stuffing. Top it with mozzarella cheese and place it in the oven. Bake for 15-20 mins or till the mushrooms are done.